I have been asked by quite a few people now to post my tattoo’s up on my blog, even though they are only little ones. I have two tattoo’s and they are quite girly but thats me :)! 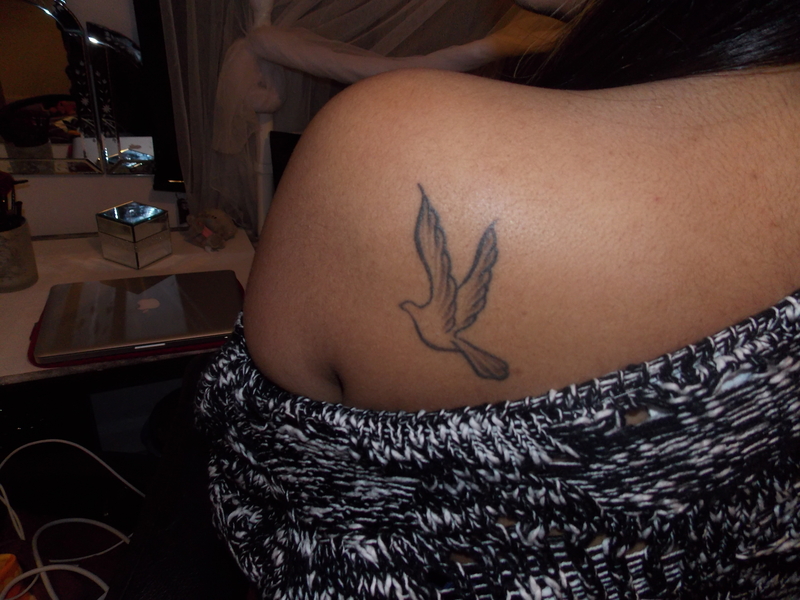 My first one was a dove just above my shoulder blade, I wanted this tattoo because it symbolises peace and freedom and I think thats me all over (not trying to sound big headed guys!). 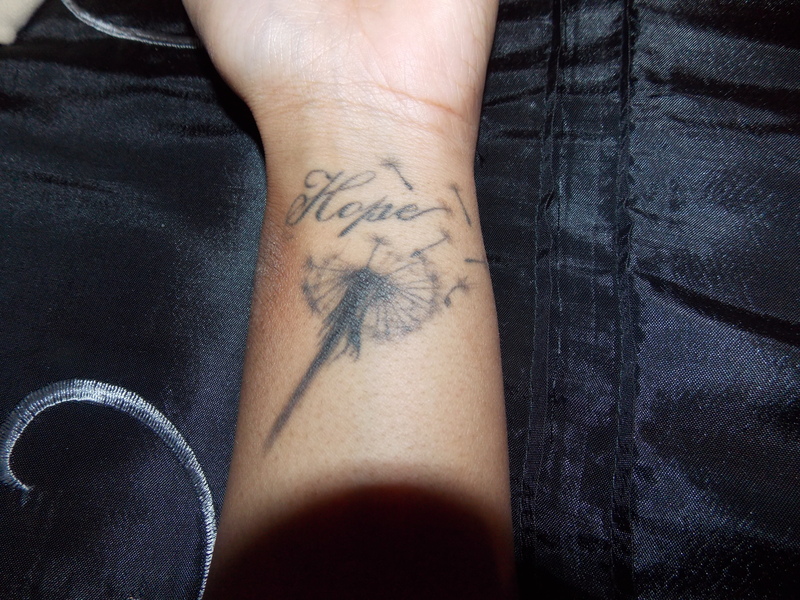 My second tattoo I had done was the word ‘Hope’ with a dandelion underneath it, I chose the word hope because it means alot to me to just keep hope in everything I do. I mean who doesn’t! Ermm there really isn’t really a reason why I added the dandelion, I just thought it would look pretty haha. Actually I can think of a reason, it kind of goes with the whole idea of hopes and dreams. As if you are making a wish when the seeds disperse, ha I backed that up quickly! Anyways things like this mean alot to me because I am the sort of person who has strong beliefs. Here is my second tattoo after rambling on a bit…. Soo these are my tattoo’s, I hope you like them! For newest news you have to visit web and on web I found this website as a finest site for hottest updates. How did you make your site look this good. Email me if you can and share your wisdom. Id appreciate it. Howdy! This is my first comment here so I just wanted to give a quick shout out and say I really enjoy reading your blog posts. Can you recommend any other blogs/websites/forums that cover the same topics? Thanks a lot! You certainly are a very powerful author. I can see this in your article. A person possess a way of writing powerful details that sets off much attention. Im having a tiny problem. I cant get my reader to pick up your rss feed, Im using aol reader by the way. I was looking through some of your content on this site and I believe this site is very informative! Keep on putting up. You completed a number of fine points there. I did a search on the subject and found nearly all people will agree with your blog. I truly wanted to construct a simple comment to thank you for all the lovely instructions you are placing on this website. My particularly long internet look up has now been compensated with extremely good insight to go over with my companions. I ‘d say that we visitors actually are very much lucky to live in a good community with so many outstanding people with interesting techniques. I feel really privileged to have encountered the weblog and look forward to really more amazing minutes reading here. Thanks once more for a lot of things. You are my intake, I own few blogs and occasionally run out from post :). “Yet do I fear thy nature It is too full o’ the milk of human kindness.” by William Shakespeare. First of all I want to say awesome blog! I had a quick question in which I’d like to ask if you do not mind. I was interested to find out how you center yourself and clear your mind before writing. I’ve had trouble clearing my mind in getting my ideas out there. I do enjoy writing however it just seems like the first 10 to 15 minutes are usually lost simply just trying to figure out how to begin. Any suggestions or hints? Cheers! The next time I read a blog, Hopefully it does not disappoint me just as much as this one. After all, Yes, it was my choice to read, however I genuinely believed you’d have something useful to talk about. All I hear is a bunch of moaning about something that you could fix if you were not too busy looking for attention. Good day! I could have sworn I’ve visited this blog before but after looking at some of the articles I realized it’s new to me. Nonetheless, I’m certainly pleased I stumbled upon it and I’ll be book-marking it and checking back often! An outstanding share! I’ve just forwarded this onto a co-worker who had been conducting a little research on this. And he in fact bought me breakfast simply because I discovered it for him… lol. So allow me to reword this…. Thanks for the meal!! But yeah, thanks for spending the time to talk about this matter here on your site. After looking at a number of the blog articles on your site, I honestly like your technique of blogging. I added it to my bookmark website list and will be checking back in the near future. Please visit my web site too and tell me what you think. I have recently started a web site, the info you offer on this site has helped me greatly. Thank you for all of your time & work. “There is a time for many words, and there is also a time for sleep.” by Homer. Good post. I learn something new and challenging on sites I stumbleupon everyday. It will always be useful to read articles from other writers and practice a little something from their web sites.